Braids are the styles to try for all seasons and many reasons. They are never out of fashion and they never let you be out of fashion as well. The best part about braids like fishtail braids is that they go with a number of outfits and especially look good with all kinds of dresses. The versatility of the fishtail braid continues even further with the fact that it can go with both day and night looks. You can combine this hairstyle with a number of other braids to get a complete stylish look. It looks great with French braids, curls or straightened hair. So just by keeping the braid in different ways, you can get a new hairstyle every day. This all-time favorite hairstyle ideas will give you a satisfactory look if you have long or medium hair. This amazing benefit is offered by few other hairstyles other than the fishtail braids. Making this braid is really easy too. You do not need to sit for hours in front of the mirror to get this look right. You can complete the fishtail braid in minutes and decorate it with any accessory that you want. This is one style that will never fail to look wow. The following are the 15+ Ideas to Make Fishtail Braid Hairstyles That You’ll Love. If you are a lady who is blessed with golden hair or if you are planning to get the hair color done in your hair, then this style with the fishtail braid is just the right fit for you. Make the fishtail braid look like a crown by starting from one side and pulling it towards the other side. Leave the rest of the hair open and make well-defined curls from the middle of your hair. this is the perfect hairstyle for the girls or women who have long hair. A fishtail braid looks great on brides too and this is one style that will make you look extra special on your special day. Keep your braid swept off on one side of your shoulder. Pull the strands of your hair outwards to add more volume to your hair. Add flowers all along the length of your hair to complete the look. Let the hair in front of the head sport a slightly messy look. If you have long hair but want to keep it off the shoulders in a stylish way, go for this hairstyle. This one is pretty easy to make also and is not as difficult as it looks. You will have to make a fishtail braid that goes around your head like a crown. The final step for this style is leaving a few strands of hair loosely hanging in front. This is the ultimate feminine and elegant look that you can try out. For this hairstyle, you will have to make the fishtail braid in two steps. One braid goes around the head and the other will come down from the bottom half of your hair. Both of these braids join at the braid to complete the look. This look gets the final touch of beauty in the form of a laurel wealth accessory that is placed right at the conjunction of these two fishtail braids. 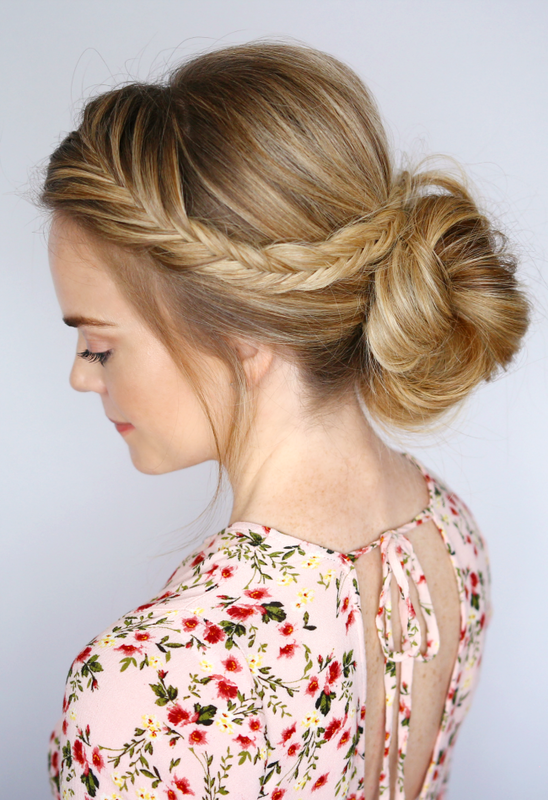 This is the perfect hairstyle to try with a dress. The fishtail braid looks great when you combine it with the classic chignon updo. Make a parting on the right side of your hair and start braiding the hair on the left side of the parting. Pin the end of your hair using bobby pins. Now gather all the hair, brush it well and pull it into a chignon. The bobby pin should get hidden in the bun so that it looks like a seamless transition from the braid to the chignon. You can combine the ponytail with fishtail braid to get a great look that you can try every day to college and even to the office. Make a fishtail braid on one side of your hair. Pin it using bobby pins and then pull up the rest of the hair into a ponytail. The ponytail must not be brushed into looking smooth and sleek. In fact, it is better to keep it slightly messy to complete the look. You must have an experience in doing the French braid. Now try almost the same technique but with a fishtail braid. This braid will only be on one side of your head. The braid should start from the top of your head and go through the entire length of your hair. The best part about this hairstyle is that it makes your hair look really nice and voluminous. This is also a great hairstyle to try at colleges or special dates. READ ALSO: African American Curly Hairstyles- Variation Lies in Styling Differently! 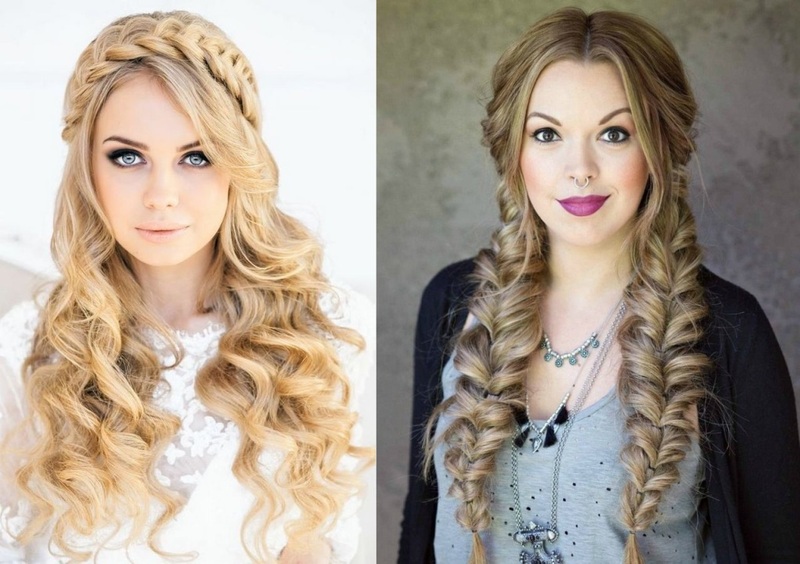 This one is for the beautiful blondes among you looking for a great braid to try out. Make a parting in the center and then pull the hair into a long fishtail braid that beautifully graces your shoulder. No need to keep it all neat and perfect with this hairstyle. Go ahead and keep the braid messy to get the look. Want to try a great new hairstyle with your new holiday dresses? 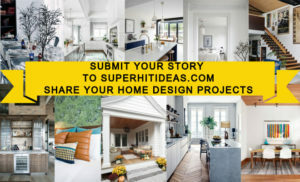 This one is just the right fit for you. The first step is pulling the hair into a messy bun. While doing this leave some of the hair out with which you can create a fishtail braid that goes around the messy bun. Complete this look with nice headbands. If one fishtail braid looks good, then two will look even better. The first step to getting this look is creating a perfect parting at the center of your hair and separate the hair into two equal halves on both sides of the parting. Make fishtail braids on both the halves of the hair and pull out the strands for added volume. Looking for a really cool hairstyle to try out with that beautiful prom dress of yours? It is the one should go for. This one looks great on the ones who have a medium length of hair. The braid should not look too prominent and must be pulled on one side of the hair. Keep it a bit messy on the front side of the hair. This one right here is the perfect combination of fishtail and French styles of braids. Make the French braid come down from the top of your head to meet the fishtail braid created from the lower portion of your hair. Do not make any of the braids too tight. Pull out the stands and keep it loose and lovely to look at. This hairstyle is a lot similar to the fishtail and chignon hairstyle. In this case, you need to make a low bun in your hair and pull the fishtail braid created from the top of your head to meet the bun. The bun should not be too high and it should be near the nape. This is the right style to flaunt with dresses. The holly heartthrob Kristen Stewart is also a big fan of the fishtail braid as is evident from this look of hers. In this hairstyle, you need to keep the hair messy all through the braid and the hair on top. This will work the best if you have a medium length of hair. You can go for hair extensions if you have shorter hair. Summers are a great time to try out the braid kind of hairstyles. Pull the hair to one side of your shoulders and make a braid. Pull out the strands of the braid as much as you can to give it the extra volume that is needed for this hairstyle. Secure the end of the braid with a hair tie. Your look for the sunny days is complete. Try this look with floral dresses or shirts to look absolutely summer ready. The style icon Miley Cyrus has tried this look during one of her appearances and now you can try it too. Keep the hair on top of the head a bit wavy and messy. Begin making the fishtail braid all along the length of the braid. The braid does not need to be too well-defined for this hairstyle. Try this style with spaghetti tops or off-shoulder dresses. Look nothing short of the princess that you are with this hairstyle on your wedding day. Pull the hair into a long fishtail braid after puffing out the front of your hair. Secure the ends of your hair with a hair-tie.